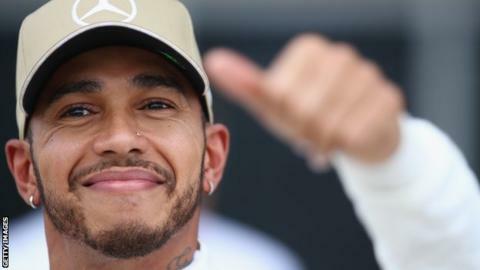 So far, the stars are aligning for Lewis Hamilton and his bid to tie up a fifth world title at Sunday’s United States Grand Prix. 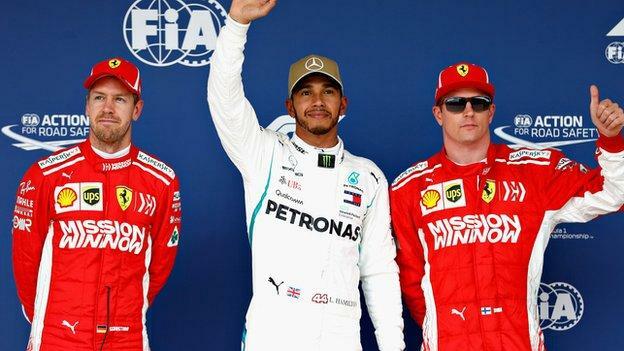 The Mercedes driver starts from pole position, won in a much tighter battle against Ferrari than was expected, and championship rival Sebastian Vettel will be fifth on the grid, a penalty dropping him from second, where he qualified. 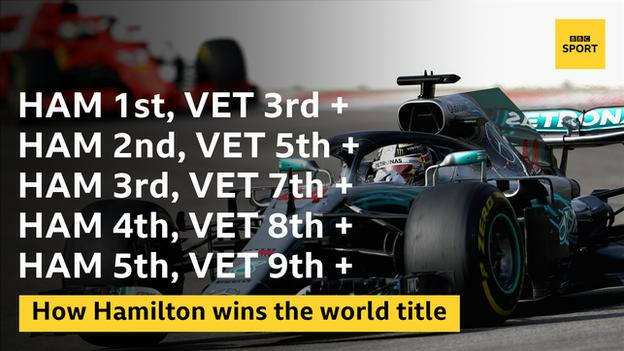 For Hamilton to tie things up, he needs to score eight more points than Vettel – and one way to do that is to win the race, with Vettel lower than second. In theory, the winning bit should be relatively straightforward for a man starting from pole on a track where he has won five of the six races held so far. Hamilton cannot control what happens behind him, but he effectively needs team-mate Valtteri Bottas, who starts third, to stay ahead of the German, whether or not the Finn also manages to beat Ferrari’s Kimi Raikkonen, who will be alongside Hamilton on the front row. It is a long way from a given, but it is certainly do-able. Heading into this weekend, Hamilton’s task had appeared relatively easy – or as easy as things get in the white heat of competition at the pinnacle of motorsport – after Ferrari’s slow implosion over the past three races. This season has been a story of opportunities missed at Maranello, mistakes from driver and team at critical times handing Mercedes and Hamilton opportunities that they grabbed with both hands. But after the end of the European season, Mercedes suddenly had a performance advantage over Ferrari of close to half a second a lap, and the silver cars appeared to have made a decisive step forward. In Austin on Saturday, though, after a Friday rendered inconclusive by a drenching from south Texas rain, Ferrari were back to where they have been all season – at least a match for Mercedes, and arguably a little faster. Again, Vettel had made his task harder than it needed to be by failing to slow sufficiently for a red flag in practice and earning his three-place grid penalty. Hamilton took pole from Vettel by just 0.061secs, with Raikkonen a further 0.009secs behind. Given that Hamilton is regarded by many as a faster driver than either, and that he has effectively owned the Circuit of the Americas since its debut on the calendar in 2012, that suggests the Ferrari is a quicker car this weekend. But how can that be, when it has been more than 0.5secs slower on average in the past three races? In other words, Ferrari put the car back into a specification it had been in before, and it is quicker like that. Or to put it another way, whatever Ferrari had done in the last three races to try to make the car quicker had had the opposite effect. Vettel’s task is to try to win the race – a very tall order from fifth on the grid – or at the very least to finish second behind Hamilton and prolong the title battle until the race in Mexico next weekend. “We will try everything. I don’t see the option or alternative. That is what we focus on. We start behind. It doesn’t help but that’s why we race,” he added. One big potential threat to Hamilton in the race is the fact that Raikkonen starts alongside him on the front row but on a softer tyre. Ferrari split their strategies in qualifying so that Raikkonen will start the race on the ultra-soft tyre. All the other drivers in the top five – Hamilton, Bottas, Red Bull’s Daniel Ricciardo and Vettel – start on the super-soft. It’s a clever move by Ferrari. Their pace in final practice and the first two sessions of qualifying suggested they could fight for pole with Hamilton and potentially beat Bottas, and that’s what happened. The ultra-soft will give Raikkonen more grip off the line and around the first lap. Allied to the Ferrari’s greater straight-lie speed, that gives him the potential to pass Hamilton. If the Finn can then stay ahead all race and win, with Hamilton second, Vettel needs only to finish fourth to keep the title alive. However, Raikkonen has not gained a place on the first lap since the Abu Dhabi Grand Prix at the end of 2016. And few would bet much on him holding off Hamilton for an entire grand prix anywhere, let alone here. Nevertheless, if Raikkonen, who has been dropped by Ferrari from the end of this year and is moving to Sauber for the next two seasons, wants to win another race, this is probably as good an opportunity as he is going to get. On the other hand, there is a reason everyone bar Raikkonen is on the super-softs – it’s a better race tyre, giving more strategic options. But track position is often king in F1. Can Raikkonen do one final job for his team? Is he even inclined to? There’s another factor to consider, too. Because Friday practice was wet, the teams have very little information on how the tyres will perform in race trim – and on the super-softs in second qualifying Vettel was 0.4secs quicker than Hamilton. Does that mean he will have an advantage in the first stint? The question led to a little needle between the title contenders in the news conference after qualifying. Who will win in Austin? 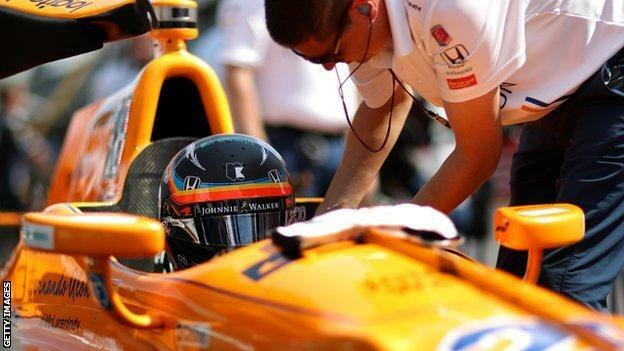 Fernando Alonso’s plans to compete in the Indianapolis 500 next year remain open but undecided after McLaren confirmed they will not compete in a full season of Indycar next year. McLaren boss Zak Brown said on Friday in Austin that McLaren were “not ready” to commit to a full season, but he said the team was still working on competing at Indy with Alonso. Brown said the Indy 500 was “something that remains of interest to us” but that a decision would be made after the end of the Formula 1 season. Indycar team owner Michael Andretti, who ran Alonso in the Indy 500 last year, has been in Austin this weekend with McLaren, but there are complications to sorting an Alonso-Indy deal with his team. Andretti uses Honda engines and sources say Honda will not provide an engine for Alonso as a result of their history together in F1. That means McLaren have to find a car with a Chevrolet engine, likely run out of the base of another team but with Andretti personnel. There are still a few areas to resolve, but right now it looks like Alonso will be gunning for the fabled triple crown again at Indy next year on that basis. 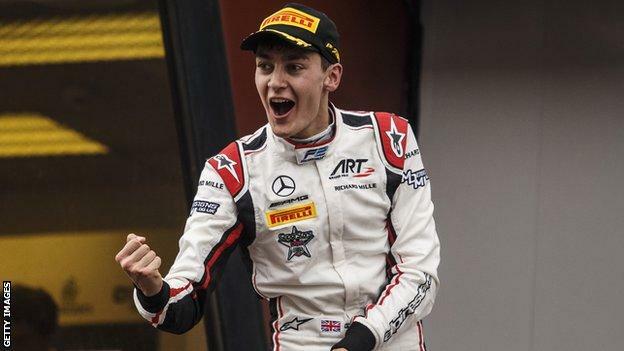 Williams’ decision to sign British rising star George Russell for 2019 represents a significant change in the team’s approach to drivers. Williams are running two pay-drivers this year in Lance Stroll and Sergey Sirotkin, but they have come to the conclusion that choosing a driver line-up largely on the basis of how much money they can bring has had a detrimental effect on the team. Williams accept that their car is not very good this year – to say the least – but there has always been a question about how much of the lack of pace has been down to the drivers – after all, Stroll was on average about 0.7secs slower than team-mate Felipe Massa last year. Stroll has definitely improved this year, the team believe, but running Russell in the simulator has convinced them the car is not as bad as it looks – the 20-year-old Formula Two championship leader was significantly quicker than either of their current drivers. So, the question now arises what to do with the second car? It is not yet officially confirmed, but Stroll is off to Force India, which is now owned by a consortium of businessmen owned by his father. Do Williams keep Sirotkin? 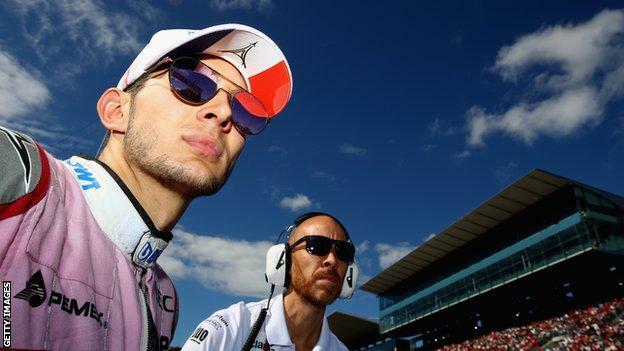 As things stand, the team’s option A is now to take Esteban Ocon, who had been left in the lurch by the Stroll move and Force India takeover and was preparing for a year as Mercedes reserve. Mercedes, who own his contract, will only release the Frenchman for a year – they want to leave open the option of promoting him to the second seat alongside Lewis Hamilton in 2020 – but Williams have come to the conclusion that it is worth it if they can make it work. They will take Ocon if they can find sponsorship to fill what is a €10-15m hole in their budget from the loss of their title sponsor and Stroll’s funding. If Williams can do that, Ocon-Russell makes a highly impressive line-up of two very talented young drivers employed on merit alone. If they can’t find the money to run Ocon, they are leaning towards giving the seat to Robert Kubica, who is their reserve driver this year. That would make a great story and guarantee lots of publicity – a return to a race seat for the Pole whose promising career was curtailed by the horrific rally crash in 2011 which left him with limited use of his right arm. Kubica, winner of the 2008 Canadian Grand Prix for BMW Sauber, is said to have backing from Poland worth in the region of €10m (£8.82m), a similar level of funding as Sirotkin has for next year. This year the Russian paid about double that. There remain question marks over whether Kubica is ultimately as quick as they or he would like – not being able to be sure about that is ultimately why they did not take him as a race driver for this year. But Kubica is well liked in the team and the feeling is that Sirotkin, who won his drive after impressing Williams in a post-season test last year, has not necessarily done enough to justify being kept on.